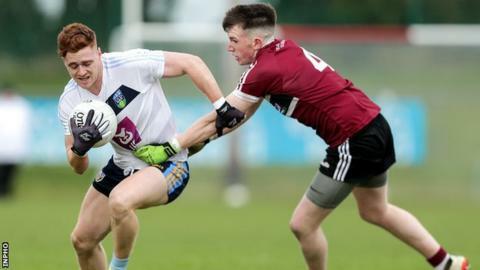 Belfast side St Mary's College have reached the Sigerson Cup final after beating holders UCD 0-10 to 0-7 in Mallow on Saturday. With their wind advantage, UCD chipped away at the St Mary's lead in the second period but the 2017 champions held on. UCC face NUI Galway in Sunday's second semi-final in Mallow. The final will take place on Wednesday evening. Stephen McConville kicked a number of St Mary's frees in the first half with Liam Rafferty and Jarlath Og Burns also on target for the Ranch. Scores from Evan O'Carroll and Antrim player Peter Healy helped cut the St Mary's advantage to four points after half-time but two more McConville frees kept the scoreboard ticking over for the Belfast college. UCD, who included St Mary's winning captain from 2017 Tyrone forward Conor Meyler, hit three unanswered scores to reduce the margin to only two points in injury-time but the Ranch struck the final score to close out the game.